Running, swimming, basketball, boxing... any sport! And reading! My childhood was very enjoyable. What’s not to like about hanging around with your friends all day, playing sport every afternoon, being cared for by two wonderful parents and sharing dinner and games with my fun-loving older brother and sister? 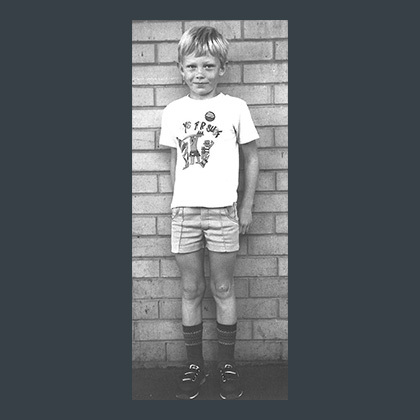 My school days were spent at West Warrnambool Primary School and Brauer Secondary College. I loved writing and sport, however trying to combine the two lead to a collision with a tree during Cross Country training and my pen coming millimetres from skewering my brain through my left nostril. I promise Mum made me wear those socks! Writing a story in Year 5. I believe it was called ‘The Left-Handed Boy with the Blue Hoodie’. The first trophy is for basketball. I think the second one is for worst haircut! Throughout secondary school I continued with my love of sport and spent many afternoons, nights and weekends playing football and basketball. Playing football with the mighty Merrivale Tigers U/18’s lead to two Grand Final appearances. 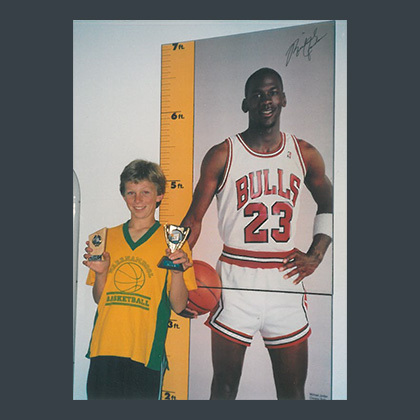 I also played a few games with the Warrnambool Seahawks basketball team. While my time was mostly spent ‘warming the pine’ I did score 6 points in two minutes at the finish of one game. I prefer to recall everyone trying their hardest and trying to stop me scoring rather than the truth that the other team was letting the young kid score a few as they were already leading by 20 points. After school I went to Ballarat University (now Federation University) and studied to become a primary school teacher. 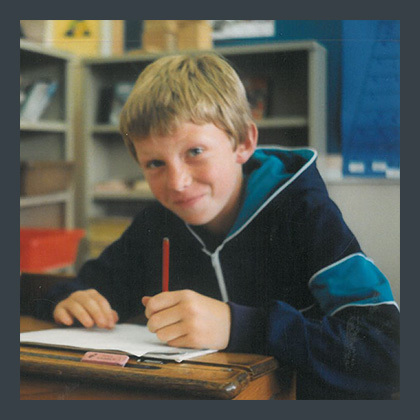 My first teaching job was a Grade 3/4 class at Bannockburn Primary School. There were a few ‘rookie mistakes’ such as trying to teach all the Preps to throw left-handed, however it was a great time. The class loved me reading the books of Paul Jennings, Roald Dahl and Andy Griffiths to them. I saw the children’s reactions to these books and realised I too wanted to be an author. I wrote my first book in two weeks and sent it to many publishers. To say the rejection letters came in like an avalanche is an understatement. Realising my writing needed improving I completed many writing courses, attended workshops and received mentoring from DC Green and Janeen Brian. My first publishing success came in 2010 with Picture Perfect and My Country being published by Blake Education. Around this time Celapene Press also decided to publish a book of mine called Mr Sergeant and the Dodgeballs of Doom and the Crazy Relief Teachers series was born! Since those first books I’ve realised being an author is the best job in the world. I can invent crazy characters and go on exciting adventures all from my writing desk at home. What's your favourite book you've written? I get so caught up with the characters, action and adventure when writing a book that my favourite is always the one I’m working on or that was most recently finished. Friends, family, students I’ve taught, newspapers, television … everywhere! The idea for My Country came from a man who declared his property in South Australia a country independent of Australia. The inspiration for the Crazy Relief Teachers series came from a few crazy teachers I’ve seen. Who's the craziest relief teacher you've ever seen? There’s been a few! There was a guy we called The Puzzler. He spent hours demonstrating and then teaching the students how to solve a Rubik’s Cube. Another was the cowboy who spent the day singing cowboy songs to the students around a pretend campfire built from cellophane. Do you put your friends in your books? Yes! Lots of my friends are in my books. The main bully in the Crazy Relief Teachers series, Radley, is my mate. He’s not a bully in real life but his name suited the character. Another of my buddies, Nathan, lent his name to one of Steele’s best friends. I made Nathan a very brainy character, but is the real Nathan brainy like the character? I guess you’d get a different answer depending on who you ask! Benjamin Griffith, one of the main characters in Mr Crikey and the Greedy Griffith, is based on a great friend from university. He’s a mover and shaker, a wheeler and dealer just like the character. 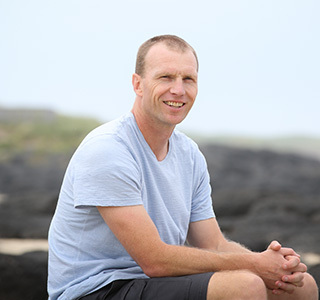 Griff actually helped with the plot of the story and the character’s inventions, such as coloured wheels, and shares like the St Arnaud Milk factory, are all businesses he’s been involved with. When my other friends read my books I’m sure they may see a character based on them! The mighty Geelong Cats are my AFL team. I also love basketball and the Golden State Warriors are my team. Teacher, supermarket worker, cinema usher, bricklayer’s labourer and cleaning up a work site for plasterers.